In modern organizations, new communication channels are reshaping the way in which people get in touch, interact and cooperate. This paper, adopting an experimental economics framework, investigates the effect of different communication channels on promise-making and promise-keeping in an organizational context. 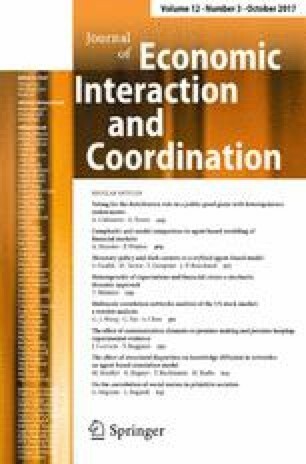 Inspired by Ellingsen and Johannesson (Econ J 114:397–420, 2004), five experimental treatments differ with respect to the communication channel employed to solicit a promise of cooperation, i.e., face-to-face, phone call, chat room, and two different sorts of computer-mediated communication. The more direct and synchronous (face-to-face, phone, chat room) the interpersonal interaction is, the higher the propensity of an agent to make a promise. Treatment effects, however, vanish if we then look at the actual promise-keeping rates across treatments, as more indirect channels (computer-mediated) do not perform statistically worse than the direct and synchronous channels. Thank you very much that you agreed to participate in the online survey. Outcome variable: minutes of procrastination in filling in the survey from the start of the survey time window. Significance levels: *** \(p<0.01\), ** \(p<0.05\), * \(p<0.10\).